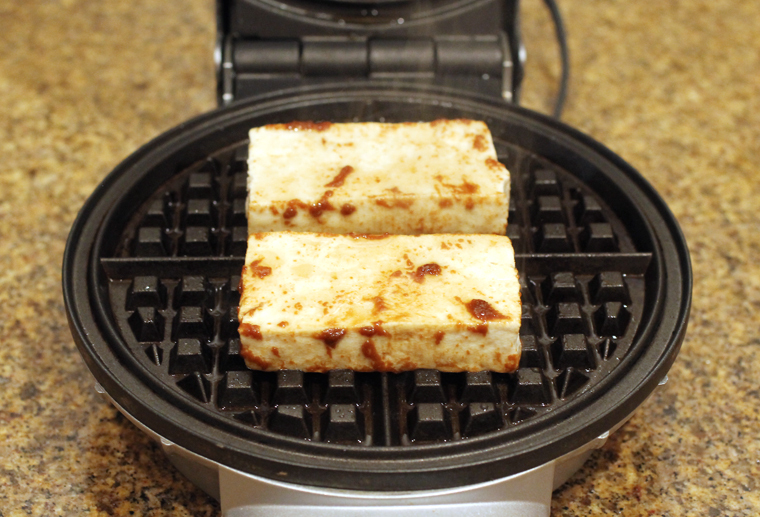 Tofu cooked in a waffle maker. How fun is that? I admit that my waffle iron sees the inside of a cupboard more often than it does daylight on a countertop. I drag it out on the rare weekends that I’m energized early enough in the mornings to whip up a breakfast of crisp, golden waffles. But ever since spying this recipe for “Waffled Miso-Sesame Tofu with Waffled Sticky Rice” on Serious Eats, I’ve been intrigued. So fascinated, in fact, that it actually prompted me to take out my much-neglected appliance to see just what it would be like to cook tofu and sticky rice, of all things, in a waffle iron. After all, I am a sucker for crispy bits. 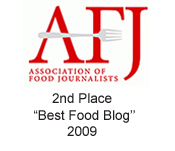 The recipe is from Daniel Shumski, creator of the blog, Waffleizer. 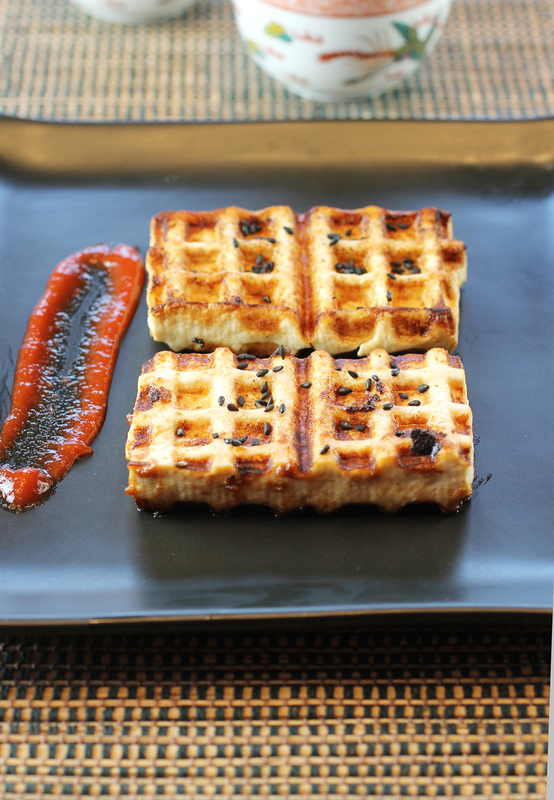 Yup, a whole blog dedicated to strange and wonderful things you can cook in a waffle iron. He’s also the author of “Will It Waffle?” (Workman), a cookbook that came out last year, of which I received a copy. 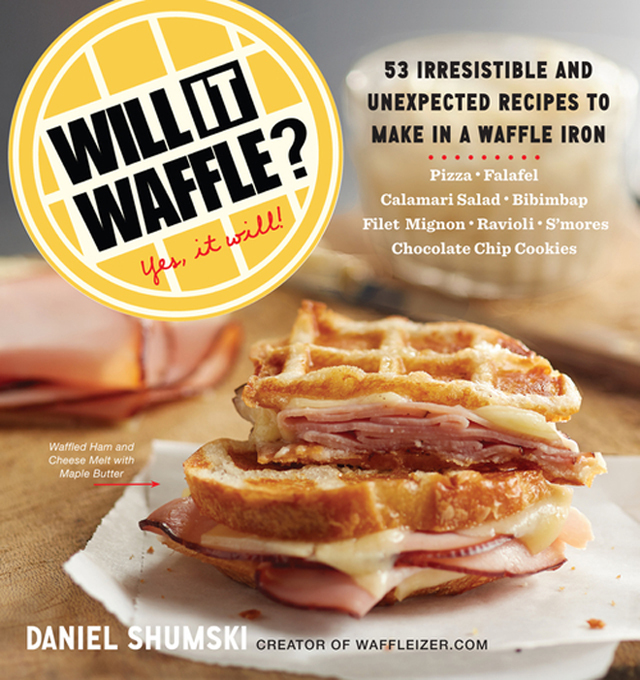 It includes 53 sweet and savory recipes for things you probably never would have imagined to stick in your waffle maker. 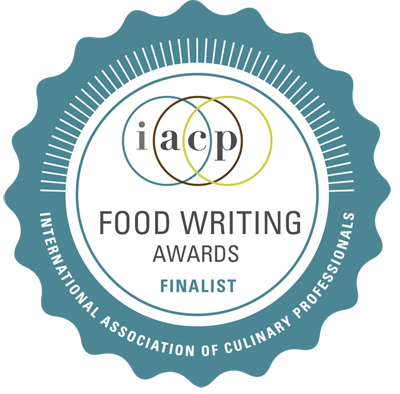 How about “Sweet-and-Sour Waffled Shrimp Wontons”? Or “Waffled Chicken Fingers”? Or “Spaghetti and Waffled Meatballs”? Boggles the mind, doesn’t it? Just be warned, though, that cleaning your waffle iron after cooking some of these recipes will take some doing. 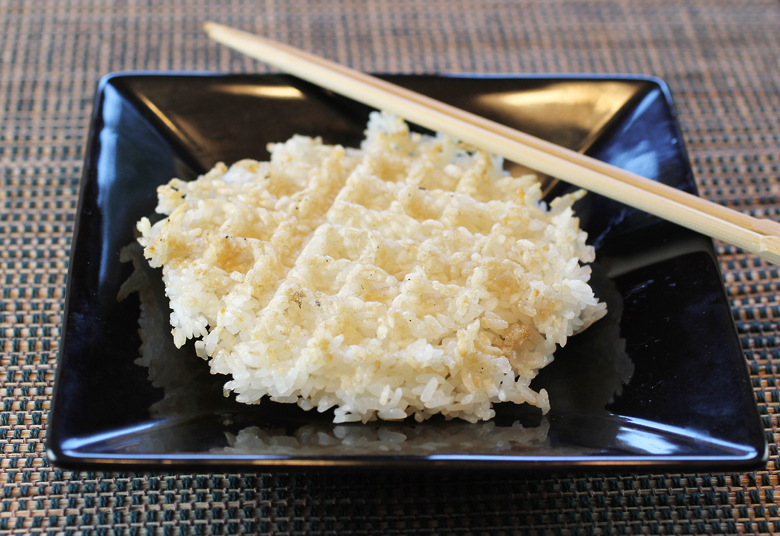 “Waffled Miso-Sesame Tofu with Waffled Sticky Rice” is not included in that book. 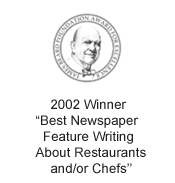 But you can find the original recipe here on the Serious Eats site. I only made a couple of minor changes. I cut the firm tofu into six slabs, roughly 3/4-inch thick, rather than the 1-inch as written. I also weighted the tofu down for about 20 minutes to extract more moisture out of the tofu before placing it in the waffle iron. Additionally, I used peanut oil rather than canola or vegetable to amplify the Asian theme. And I sprinkled on black sesame seeds before serving for an extra flourish. Putting my trusty waffle iron to the test. The verdict? Maybe it’s because I have a regular waffle iron and not a Belgian one with deeper crevices, but I found that it took more than twice as long to get the tofu crisp — about 8 minutes total. The tofu isn’t as crusty as if you’d deep-fried it, but it ends up fairly crisp on the outside. The weight of the waffle iron does leave the interior of the tofu denser and chewier, so you do have to like that type of texture. The rice also took three times longer to crisp than suggested — about 6 minutes total. If you love the tahdig or crispy bottom layer of Persian rice, you’ll enjoy this. The rice gets wonderfully crunchy, almost like that of a rice cracker on the edges. The rice, after it emerges from the waffle iron. Shumski recommends chopping up the waffled rice and tofu to serve in bowls. But I left them whole as is, because they’re just so darn cute and crazy looking that way. After going to all the trouble of dragging out your waffle iron, why hide the fact the rice and tofu were cooked in such a novel way, right? Lay a lint-free kitchen towel or two layers of paper towels on a rimmed baking sheet. Lay the tofu slices on top in a single layer. Top with another two layers of paper towels. Place another baking sheet on top, and weight it down with large cans for about 20 minutes to extract excess moisture. In a shallow bowl or deep plate, combine peanut oil, sesame oil, miso paste and soy sauce. Place tofu in soy sauce mixture and turn to coat. Coat both sides of a waffle iron with nonstick cooking spray. Place tofu in waffle iron, close lid, and cook until golden brown and crisp, about 3 to 8 minutes, depending upon your appliance. Repeat until all the tofu is cooked. Spray both sides of waffle iron with more nonstick cooking spray. Place a generous 1/2 cup of rice in the waffle maker. Close lid and cook until rice is just golden and holds together, about 2 to 6 minutes, depending upon your waffle maker. Repeat with remaining rice. Place rice and tofu on plates. Sprinkle tofu with black sesame seeds, if you like. Accompany with more soy sauce, sesame oil and Sriracha for drizzling at the table. Oh, what a great idea! That tofu looks really mouthwatering and I love how the rice turned out. A fun book. My waffle iron have the same fate as yours. Tofu is one of my favorite food and the one you made looked delish. Thanks for sharing. Wacky? Yes! But ever so inventive. Who would have thought?! This is one of the reasons I love Food Gal. I will definitely try this recipe Carolyn…great and simple way to serve tofu…like the miso paste on it. Very interesting idea, I’ve tried a lot of recipes before but this one make me really curious. What a genius, I definitely will try this. Great idea! My favorite food is Tofu and the one you made looked delish. Thanks for sharing. A great way for tofu. This tofu looks so tasty! I’ll try it for my family next weekend. Thank you. I bookmarked this months ago and finally made it last night. I don’t have a waffle iron, but I do have a Cuisinart Griddler (basically a dual-purpose panini press). Definitely a success! I loved the chewy texture of the tofu. I wish I could have had more of a crispy outside, as imagine the waffle iron creates, but still lovely. The rice was the real winner. My husband isn’t a big fan of rice, but even he enjoyed the crunchy crust. Served it with green beans and peppers in an orange sauce. Great weeknight meal! Thanks so much for sharing! Cindy: Glad you had a chance to experiment with the technique even using a griddler. Yes, the crispy rice is THE best. So good! Pingback: The best dinners you never knew you could make on a waffle iron. Pingback: 12 healthy dinner ideas for your picky eater. Yes, really! Tafu is my best food and my whole families loving this food. It seems to look very delicious recipe. I tried various items using tofu, but this could different. Can’t wait, definitely, I will try. wow,now I know how to cook my tofu in a way that my daughter will like.